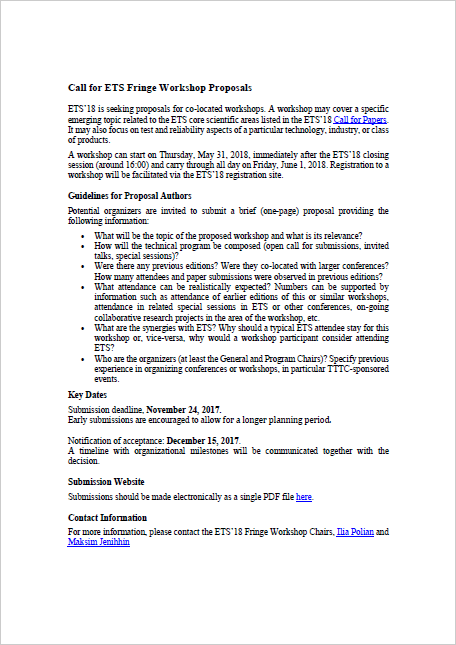 ETS'18 is seeking proposals for co-located workshops. A workshop may cover a specific emerging topic related to the ETS core scientific areas listed in the ETS'18 Call for Papers. It may also focus on test and reliability aspects of a particular technology, industry, or class of products. A workshop can start on Thursday, May 31, 2018, immediately after the ETS'18 closing session (around 16:00) and carry through all day on Friday, June 1, 2018. Registration to a workshop will be facilitated via the ETS'18 registration site. Submission deadline, November 24, 2017. Early submissions are encouraged to allow for a longer planning period. Notification of acceptance: December 15, 2017. A timeline with organizational milestones will be communicated together with the decision. For more information, please contact the ETS'18 Fringe Workshop Chairs, Ilia Polian and Maksim Jenihhin.